Whenever I go to IMH, there is this super duper weighing machine that I never failed to check it out and watching my weight increasing steadily is not very fun especially my kids will constantly tease me. So for tonight's dessert, I make a non bake Tofu Cheesecake with home made berries jam. 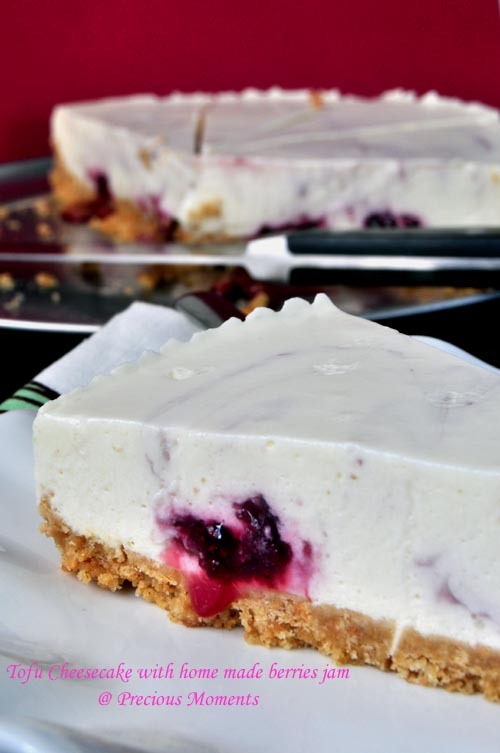 I really love the Home Made Berries Jam along with this tofu cheesecake. It definitely adds some flavour to it. My son who doesn't really like wobbly or creamy dessert didn't reject this. As for my girl, she naturally had her second helpings. I really have to watch this little one. She goes for quantity and not quality. As my hubby's saying with regards to food, what comes what dies. So I am very lucky to have two not fussy eaters at home for this moment. Am glad that hubby had a taste of it before he goes off. Boil the berries, sugar and lemon juice at medium fire. Once boil turn to low fire. Stir constantly all the time. When it starts to boil and bubble form, scoop away the bubbles. Keep boiling at low fire till the mixture become thickens. The mixture will be a little runny when hot but will set after it cool off. 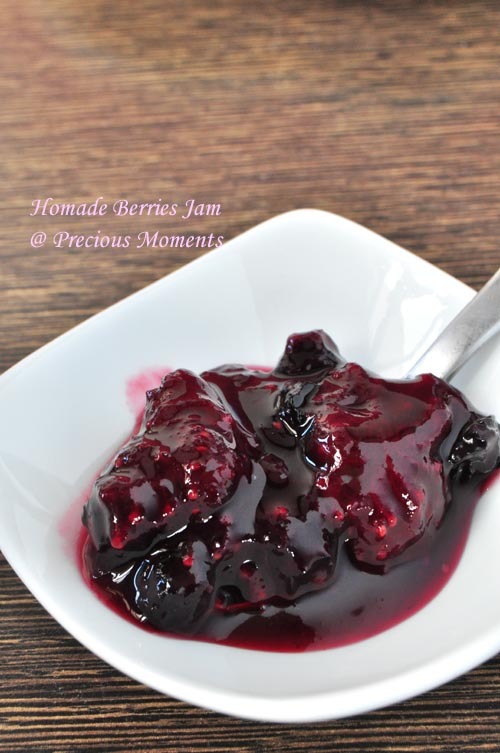 Pour the hot jam into sterilised jars. Secure tight leave cool then keep in the fridge. Notes: need to use a wooden spoon to stir. it looks DELICIOUS! you mind sharing your recipe? thank you!! a very happy new year to you, edith! yes, this month we are bound to put on some weight but worry less...just eat and enjoy! Edith Happy New Year and Happy detox!! May you have a PURE AND HEALTHY 2012.